I feel very fortunate to live in Boulder, CO — a paradise for health-conscious people like me and my husband. We have plenty of sunshine, low toxin spas, a half-dozen health food stores, and restaurants with tasty, gluten free options. But other parts of the United States may not be as friendly to the organic, healthy, gluten free lifestyle that plays a big role in recovering our health. I know that eating well and using non-toxic products can be more difficult and expensive in some parts of the country where healthy markets and restaurants might not be easily accessible. That’s why I put together some resources and tips to help my readers source healing food, no matter where they live and what their budget may be. While eating organic, grass-fed foods can be more expensive than conventionally raised, packaged and processed foods, there are certainly ways to still eat healthy and stay within your budget! I tried a lot of different diets on my road to subduing my Hashimoto’s symptoms and getting into remission, but the diet I eventually landed on was a modified Paleo-style diet. Though there is no “one-size-fits-all” diet that will work for everyone, and each person will need to address their own food sensitivities and nutrient deficiencies, there are a few things that I recommend to just about everyone who is looking to feel better. High quality protein – Protein is an important source of amino acids such as glutamine and L-tyrosine, which repair gut cells and create thyroid hormones, respectively. Protein sourced from animals is more easily absorbed by the body. Meat can be bought in bulk with delivery options, which I’ll discuss later in this article. Berries – Berries are a great source of antioxidants and myo-inositol! Frozen berries are cheaper than fresh ones. They are also usually more nutritious, as they are flash frozen instead of being transported fresh (which means they don’t lose their nutritional value during transportation). Green smoothies – I encourage people to load up on micronutrients by making their own green smoothies. It’s an excellent way to boost the number of vegetables you consume on a daily basis in an easy-to-digest way. Leafy greens, carrots, cucumbers, celery, and fresh herbs are all inexpensive smoothie ingredients that can be purchased at your local grocery store or farmer’s market. For an excellent (and inexpensive) source of protein, you can also add protein powders (like Rootcology Organic Pea Protein or Rootcology AI Paleo Protein) to your smoothies. One serving of Rootcology Organic Pea Protein powder costs about $3, and one serving of AI Paleo Protein powder costs about $2 (it’s even less, if you subscribe and save to get 10% off!) — so a daily green smoothie may only cost about $5, to replace an entire meal! Bone broth – Bone broth, which helps to heal damage to the digestive tract, is both easy and cheap to make. All you need are 3-4 lbs of bones from organic or pastured meat, and you’ll be on your way to a healthier digestive tract in no time. Cruciferous vegetables – Vegetables such as broccoli, Brussel sprouts, and kale are highly nutrient-dense without being high-priced. Leafy greens are especially great choices that help move toxins out of the body. Look for sales on seasonal vegetables for the best deals. Cilantro – Fresh herbs like cilantro, which can help remove heavy metals from your body, are generally very cheap — but you can also purchase dried versions, which will last a long time in your pantry. Turmeric – Turmeric has a well-researched track record of reducing whole body inflammation, healing the gut, and detoxifying the body from heavy metals. You can buy turmeric in bulk from Amazon for less than $10/lb and add it to your soups, teas, and curries for a great health boost. 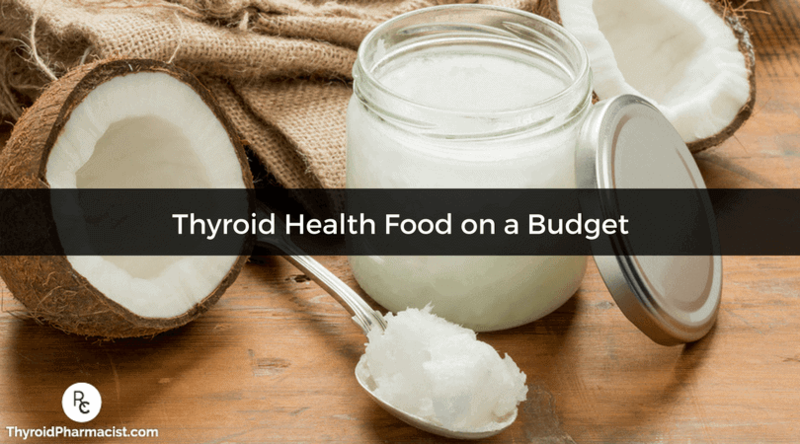 In essence, the ideal thyroid diet will include plenty of whole foods, along with a few foods that I’ve found to be particularly healing to the gut, and helpful for eliminating toxins. You can read my article about the best diet for Hashimoto’s to learn more about my diet philosophy and the foods I recommend to help you along your healing journey. If you have a health food store near you, those are great places to find organic and nutritious foods. But, for a lot of people, that may not be the case. Some health food stores can also be pricey and not practical for everyday shopping needs. Don’t worry — with a little practice, you can learn to navigate your local grocery store to find the healthiest foods for your lifestyle! Shop the perimeter of your store. One of the foundations of a healing diet for Hashimoto’s is to eat plenty of whole (unprocessed) foods. This includes fresh fruits, vegetables, and meats (organic and pasture-raised or wild-caught, when possible). These foods are usually located on the outside edges of the grocery store. By avoiding the aisles of processed snacks and junk foods, and filling your cart with as much fresh produce and meat as possible, you’ll be well on your way to preparing healthy meals, no matter what grocery store you’re shopping in. Purchase cheaper cuts of organic/grass-fed meat. You can usually find chicken thighs and legs, skirt steaks, and organ meats at a cheaper price compared to chicken breasts or more expensive cuts of beef. Additionally, these cuts are generally more nutrient-dense and offer more value for your money. Keep in mind, however, that these cheaper cuts of meat tend to be tougher and may need to be slow-cooked. Avoid the Dirty Dozen. Most grocery stores, even the conventional, big-box stores, now carry at least a small selection of organic fruits and vegetables. Though they are usually more expensive than their conventionally-grown counterparts, I do recommend that you try to eat organic as much as possible to avoid the toxic pesticides that are present in so much of our food supply these days. If, however, you have a strict budget, I recommend you take a look at the Environmental Working Group’s Dirty Dozen list. This list is updated every year to include the top 12 most contaminated fruits and vegetables to avoid, as well as the top 12 foods that have the least contamination and can be purchased from conventional sources. Having this information on hand will allow you to buy organic when the health benefits are really worth the extra dollars, and conventional when it makes more sense for your budget. Watch for sales and stock up your freezer. Most grocery stores send out coupons (there are even coupon apps you can use on your smartphone!) or have regular sales on specific items. I like to keep my eye out for sales on quality meats and stock my freezer when I find a good deal. This way, I’m not spending much more on grass-fed meat than I would on factory farmed meat, and I’ve always got something on hand when dinner time rolls around. Choose nutrient-dense foods to maximize your health food budget. Loading up on inexpensive foods that will add the most nutrients for your dollar is another way to maximize your food budget. Kale, for example, is arguably the healthiest of the green, leafy vegetables, as it contains high amounts of vitamins C, A, K1, and B6, along with potassium, calcium, magnesium, copper and manganese. Retailing for under $2 a bunch, kale can greatly boost the nutrient density of your meal. Likewise, sweet potatoes are loaded with potassium, magnesium, calcium, iron, vitamin C, vitamin B6, as well as vitamin A. They are full of fiber and are incredibly filling, making them an inexpensive way to feel satiated, while maximizing your nutrition. Depending on your location, it can be challenging to find quality health foods at a good price in some local supermarkets. The good news is that with the internet at our fingertips, the options to order healthy foods online are almost limitless. I’ve discovered a few favorite places I like to source food from, that offer cheaper prices than my local health food stores often do, as well as a wider selection of foods that are great for preparing the types of meals that are healing for Hashimoto’s. One of my favorite online health food stores is Thrive Market. Thrive Market is a unique online marketplace with a mission to make healthy living easy and affordable for everyone. It operates on a Costco-like membership model (they offer super low prices to members), and the products are delivered right to your door! They have everything you need, from GMO free food, snacks, vitamins, and supplements, to personal care products, cleaning supplies, beauty products, kitchen staples, pantry essentials, and baby products. While I am a big proponent of investing in your health, I appreciate that not every family has the resources to do so. I was so inspired to learn that Gunnar Lovelace, the CEO of Thrive Market, was raised by a single mom, and is very dedicated to making healthy eating affordable. Not only are the prices of all of the items on Thrive always at 25-50 percent below traditional retail store prices, but also, for every paid membership, Thrive donates a free membership to a low-income American family! This makes me feel very good about supporting their business model. Even their packaging is made from recycled paper! Amazon is another great resource where you can find a wide variety of health foods and supplements at some of the best prices. You can find almost anything you’re looking for on Amazon, so I encourage you to look for the best prices on the healthy foods that you love to eat. Another online resource I recommend is meat delivery services like Butcher Box. Though grass-fed meat is generally more expensive than factory farmed alternatives, I believe the health benefits of the pastured meats make it well worth it to your health. Pasture-raised, organic and grass-fed meats are higher in health-restoring omega-3s and are an important part of a healing diet. Conventionally raised meats, on the other hand, are almost always loaded with growth hormone and steroids that can affect thyroid function and create a toxic burden on the liver. They are also often raised on a diet filled with corn, which not only greatly reduces the levels of omega-3s present in the meat, but also makes the animals more susceptible to E. coli, which can be passed onto humans. For these reasons, it’s important to consume naturally farmed meats as much as possible. By ordering your grass-fed meat in bulk through a company like Butcher Box, you can cut down on the price per pound — making it more affordable to get plenty of healthy protein into your diet. ButcherBox delivers 100 percent grass-fed beef, free-range organic chicken, and heritage breed pork for less than $6.00/meal. Use my code THYROID to get $10 off your order and free bacon! US Wellness Meats is another butcher company that I trust. This company produces the finest grass-fed and organic meats, without the use of antibiotics or growth hormones. They offer a variety of organic meats and poultry, including beef, bison, lamb, pork, rabbit, chicken, and duck. They also have a selection of wild-caught seafood. If you are looking for a monthly subscription for wild-caught fish, then Vital Choice Seafood and Organics has you covered. A trusted source for fast home-delivery of the world’s finest wild seafood and organic fare, harvested from healthy, well-managed wild fisheries and farms, Vital Choice is a leading source of pure, healthful, and sustainable seafood. In most areas, you will be able to find local farms and co-ops that offer weekly or monthly deliveries of farm-fresh vegetables, fruits, eggs, and other locally produced foods. These services, often called CSA (Community Supported Agriculture), usually offer organic produce at cheaper prices compared to health food stores, as transportation and middleman costs are reduced. Reducing transportation time also increases the nutritional value of your produce, as they can be picked at peak ripeness and sold same-day, versus fruits and veggies at the grocery store which are picked before they are ripe and often sit in warehouses and on trucks for weeks at a time. Plus, it can be pretty satisfying to know that the food you are eating was grown by a farmer down the road! Farm Fresh To You is one such service that offers a variety of produce boxes, sourced from farms in your area and delivered right to your door. You can also visit the United States Department of Agriculture’s Local Food Directory to search for a CSA in your area. If you’re thinking, Great! Now I know where to get meat and veggies from, but what am I going to do when I don’t have time to cook?, I have you covered! Be sure to also check out Paleovalley Snacks. Paleovalley provides delicious meat sticks that are free from additives and sourced from grass-fed, pasture-raised animals. They have bundles that you can purchase at a better discount, and they are great for on-the-go snacks. I know time is money, so I hope these resources are helpful for you! Because I believe so strongly in the healing power of real food, I poured my heart into creating my new cookbook and nutrition guide, Hashimoto’s Food Pharmacology: Nutrition Protocols and Healing Recipes to Take Charge of Your Thyroid Health! In it, you’ll find 125 thyroid-healing recipes that are easy to prepare and can be adapted to any budget. I’ve also included plenty of information about the healing potential of food, the kitchen tools and cooking strategies I use to easily prepare meals, shopping tips to save you time and money, three weeks worth of meal plans to get you started, and more! My goal is to make eating a nutrient-dense, gut-healing diet easy for you, no matter your budget or location. Whether you are shopping your local grocery store, eating out with friends and loved ones, or searching for healthy foods online, I hope that some of these resources are helpful to you and encourage you to eat with health and enjoyment in mind. P.S. You can download a free Thyroid Diet Guide, 10 thyroid-friendly recipes, and the Nutrient Depletions and Digestion chapter of my first book for free by signing up for my newsletter. You will also receive occasional updates about new research, resources, giveaways and helpful information. For future updates, make sure to follow us on Facebook too! Note: Originally published in April 2015, this article has been revised and updated for accuracy and thoroughness. Which juicer do you recommend? I have done some research and the articles appear to be biased in favor of the writer’s ‘preferred. Am hoping you can suggest a budget friendly juicer. Thank you for investing in our health. What a lovely lady you are! Always offering great tangible advice, thank you pretty lady I look forward to your book and hopping on the websites you have suggested. Also enjoy your newsletter! I would like to suggest another good online source for supplements and special foods. Check out luckyvitamin.com. They have good prices on most things and unlike Thrive Market , you can buy single items of things like snack bars without having to buy a whole box. Hello. I just listened to your episode on The Broken Brain pod cast. I was diagnosed with Hashimotos when I was 23 (I’m now in my 40’s). The only treatment offered to me has been synthroid. After yrs of brain fog and scraping by I finally reached out to a naturopath who finally has been an advocate and supporter for me. She has started me on a gluten, dairy, soy and sugar free diet with additional supplements that is helping. She has asked me to look into a drug called LDN taken in very small doses as an additional healing support. Internet research seems to show positive results. I was wondering if you had any thoughts of using this to help with autoimmune issues.